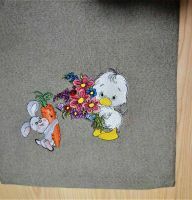 Get inspired by this beautiful machine embroidery design which might just be what you want for your next project. This original needlework features a pretty girl with a wreath of lilies on her hair. The lush pink flowers look fabulous and make the focal point of this design. The color choices include ruby glint, ming, memphis belle, ozone, glow and sage among others. 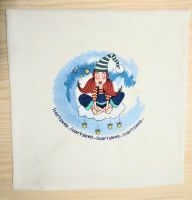 This embroidery design will be a lovely addition to a whole variety of things, for example handbags and makeup bags, purses, scarves, denim jackets, T-shirts, towels, pajamas, bathrobes, napkins, blankets, cushions, quilts and more. 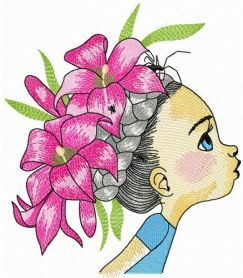 Thanks for digitizing such a handsome girl with flowers! 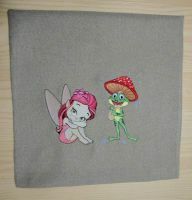 Downloaded fastly to my embroidery cart. Looking forward to sewing something beautiful on my weekends. Great store!